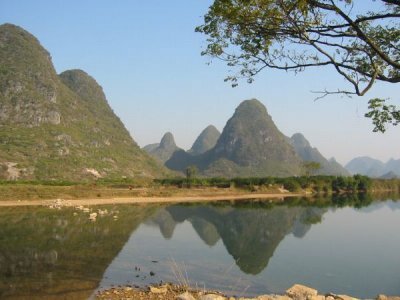 This must be the most famous scenery in China so we thought we must see it, even if it wasn't on our way. We left our bikes in Xi'an and caught the train there for a Christmas break. Yangshou is a lovely town to hang out in, there are lots of tourists so nobody stares at you as if you were a Martian, and the hawkers aren't too bad either. 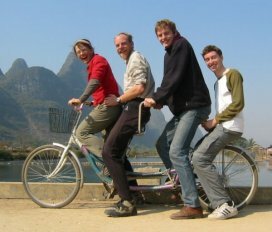 Our first day we hired a tandem and went for a ride with Matt and Benny, forestry students from Germany that we met in the hotel. It was great to be able to converse in English after so long by ourselves in un-touristed areas. Everywhere we went the scenery was awesome. Riding a tandem was fun too and made up for not having our bikes with us. 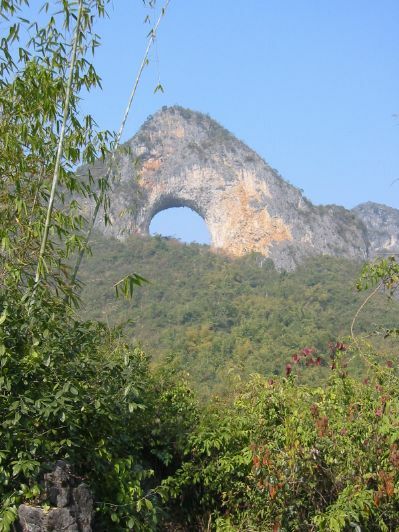 Another day we climbed Moon Hill. 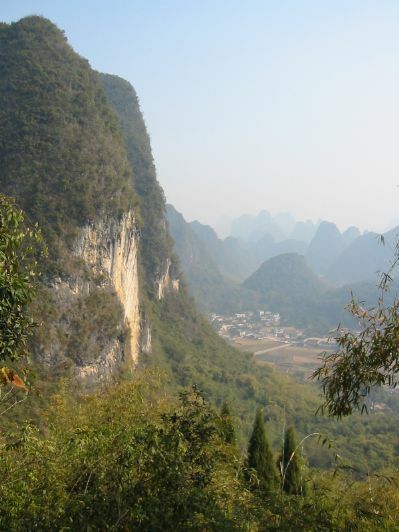 There is rock climbing there but the easiest route is 5.9 so we weren't tempted! On Christmas Day morning we were walking down the main street and someone tapped me on the shoulder and said "Are you Mark McLean?". It was Duncan, a friend from the caving club at Cambridge. 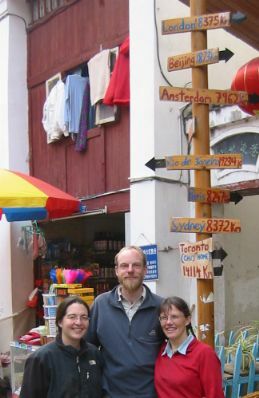 He and his girlfriend Erin, who we've also met before, have been living in Guilin at the Karst Institute for two years. They describe themselves as "speleo - bums", making a living by living frugally and teaching a bit of English or writing reports on their caving activities. Meanwhile they are exploring some of the deepest caves in China. We spent the day with them and other friends, drinking tea and beer in the "Karst Cafe" which is the nearest thing to Bernies of Ingleton within 8000km of here. We know it's 8000km because outside the Karst Cafe is a signpost indicating that London is 8375km away and Sydney is 8372km, so we are exactly half way! Christmas itself was a bit of anti-climax because we both succumbed to coughs and colds caught on the public transport on the way to Yanshuo. 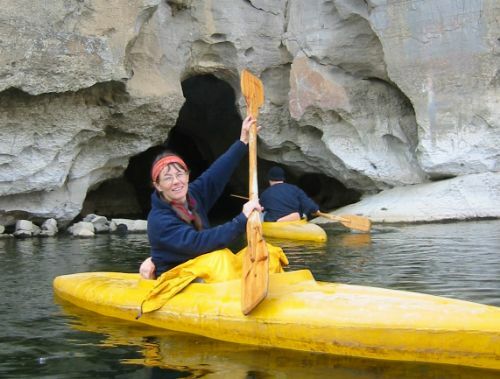 But a couple of days later we were well enough to hire kayaks and go for a paddle from Fuli to Puyi with a Parke and Kristy from Saipan we'd also met in Xi'an. It was a lovely way to see the scenery, the river was easy and flat but fast enough that we didn't have to paddle too much. Here we have found a small cave that we could actually paddle inside! 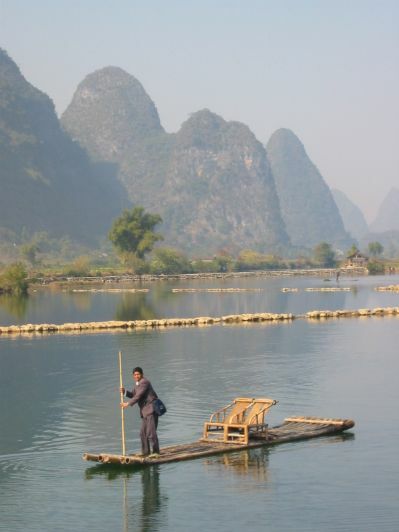 The last day we got a bus to Xingping and went for a stroll along the river, admiring the view and chewing on a sugar cane (they grow there). 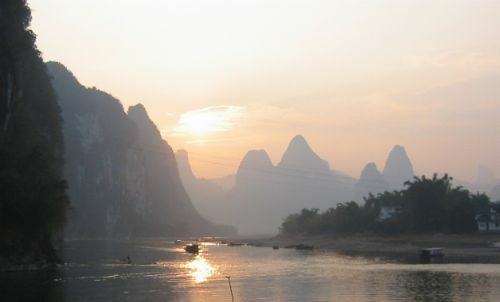 As we wandered back the sun was setting behind the karst peaks.